Lovebugs are small black flies with a red thorax that have been invading our lives in April-May and August-September. They are considered a nuisance mainly because they congregate in large numbers along highways and splatter on windshields and grills of our cars. Damage: Car's windshields become covered with the fatty remains that can become thick enough to obscure vision. The flies can also clog radiators and cause our cars to overheat. The fatty tissue can pit our car's finish if not removed within a few days. A word of caution, do not paint your house now, lovebugs can mar freshly painted surfaces. Feeding: Adult lovebugs are harmless - they do not sting or bite. They feed on the nectar of various plants, especially sweet clover, Brazilian pepper and goldenrod. 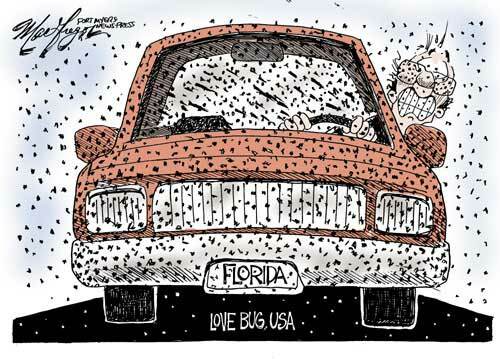 Frequency of flights: Two flights of lovebugs occur each year in Central Florida. The spring flight occurs during late April and May. A second flight occurs in fall around late August and September and flight periods generally last 4-5 weeks. Flights are usually restricted to daylight hours and temperatures above 68 degrees F. Mating takes place almost immediately after emergence of the females. Adult females live only 2 to 3 days. 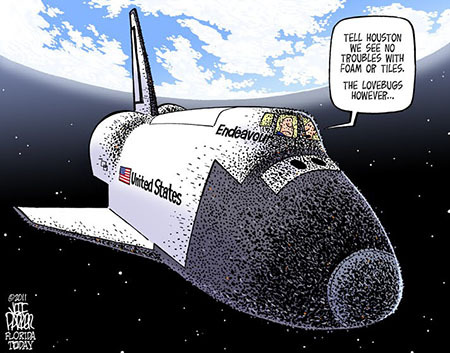 Control: There are several effective insecticides available for lovebug control, but spraying can be impractical because infestations occur over such a vast area and for a short period of time. You can control lovebugs in confined areas like porches and around your home with aerosol sprays available for other household insects. 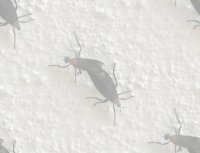 Predators have substantially reduced the population of lovebugs in Central Florida during the past several years. Lovebug larvae populations are extremely high in pasture areas, making an ideal environment for certain bird predators like robins and quails. Armadillos are thought to be predators as well, but scientific data has yet to back this up. Certain beetle larvae, earwigs and centipedes have been found to be natural predators of lovebug larvae in the soil. Lovebugs and your car: There are several things a motorist can do to lessen the lovebug nuisance. First, traveling at night can reduce the incidence of lovebugs since they are active only in the day, usually after 10 a.m. Also traveling at a lower speed will reduce the number of bugs splattered on your car. There are many types of screens available that can be placed on the front grill of your car to protect the finish and prevent the radiator from becoming clogged. If a large screen can't be used on the front of the car, a smaller screen can be put behind the grill but in front of the radiator. Splattered lovebugs should be washed off the car as soon as possible. Cars that have been waxed recently are more protected from damage by lovebug residue. Soaking the area with water for several minutes will aid in removal too. When lovebugs are numerous, or you know you will be traveling at the peak times, you can spread a light film of baby oil or use an aerosol oil spray over the front of the hood, above the windshield, and the grill and bumper. This practice will make lovebug removal easier.